Are you a DIY clipart enthusiast? Me too! I just love clip art. I am dental hygiene enthusiast too! This is a Set of 9 Dental Clip Arts - denal care, white teeths, tooth brushing, tooth paste, braces, tooth caries, canal treatment, dental crown, healthy teeth. 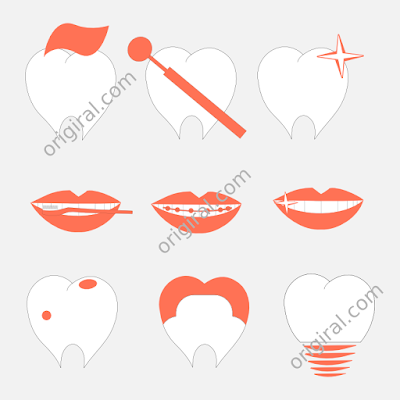 Each separate clip art in this set is included in both high quality 300dpi PNG format with transparent background and also JPG format. Also includes a file in SVG format perfect for cutting machines. No gradients, only solid colors! Each art piece is approx 5,55 inches on its longest side. Your purchased art will be free of watermarks!